Get ready for a cracking Easter with a meringue wreath that’s sure to be a showstopper. 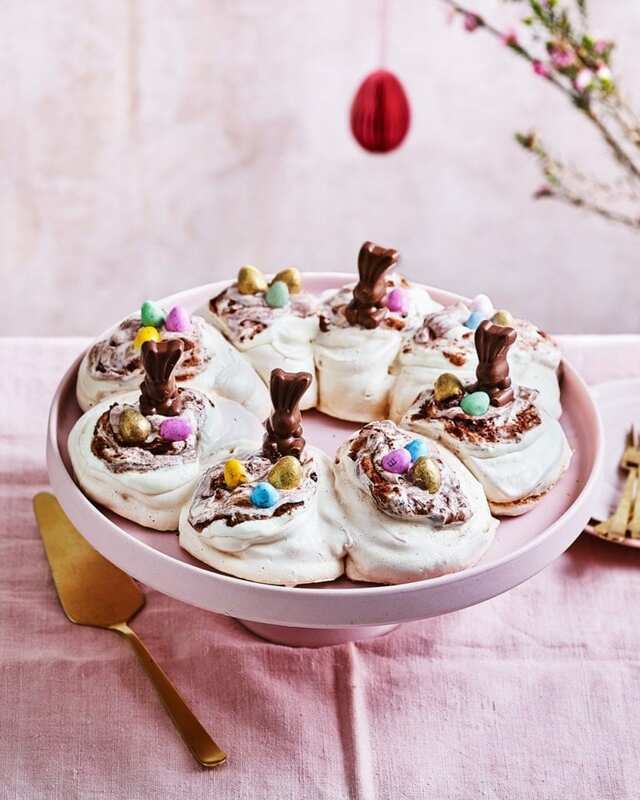 Everyone will want to dig in to the swirls of meringue filled with chocolate cream and topped with Maltesers mini bunnies, Galaxy golden eggs and M&M’s eggs. Heat the oven to 110°C/90°C fan/gas mark ¼. Drain the chickpeas through a sieve, catching the liquid in a large bowl. Keep the chickpeas for another recipe. Whisk the chickpea liquid with an electric hand whisk or in a stand mixer until it looks like whisked egg whites – light fluffy and holding soft peaks. This will take a while – up to 10 minutes – depending on the brand of chickpeas you use, so persevere. Sprinkle in the cream of tartar and a couple of spoonfuls of the sugar and whisk again, then continue adding the sugar a spoonful at a time whist whisking. Once all the sugar is added the mixture should be thick, fluffy and holding stiff peaks when the whisks are removed. Line a baking sheet with a piece of baking paper and draw around a dinner plate (approximately 27cm diameter). Then turn the paper over, so that you can see the circle through it. Spoon 8 blobs of the meringue mix around the inside edge of the circle, then give them a swirl and create a dip in the middle to make them look like nests. They should be touching, to create the wreath. Bake on the bottom rack of the oven for 1 hour 10 minutes, then turn off the oven and leave the meringue inside to cool. When the meringue is cool, and you’re ready to serve, whip the cream with the icing sugar until it is thick, then whisk in the yogurt until thickened again. Sprinkle the cocoa over, then swirl through. Divide the cream between the meringue nests before decorating with the Maltesers mini bunnies, Galaxy golden eggs and M&M’s eggs. This recipe has been produced and tested in partnership with a third party.